Could you handle a Ferrari F430 GT racecar speeding over 100mph on a track? 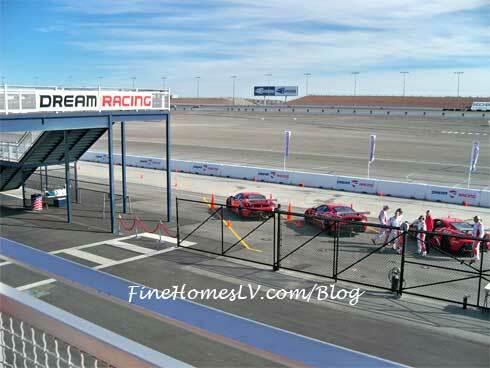 That’s what I was going to find out when Dream Racing wanted me to visit them at the Las Vegas Motor Speedway. Having learned to drive on the Infineon Raceway in Northern California and the NASCAR track at the Las Vegas Motor Speedway, I was excited to get my hands on a Ferrari F430GT. Ferrari is synonymous with Italian luxury and super cars. 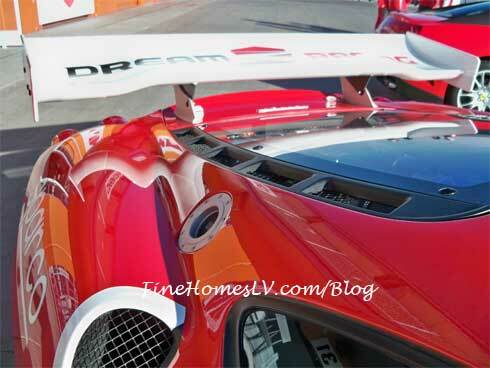 Dream Racing is all about luxury and their Ferrari racecars. The racing experience is located on the inside of the Las Vegas Motor Speedway and has most of the media center, Neon Garage South and a track adjacent to the NASCAR track. When I entered Dream Racing, I immediately noticed several hostesses dressed in uniforms with red scarves, fine Italian furniture, an espresso coffee snack area, a race inspired apparel store and the race lockers. Unlike other racing experiences, the Dream Racing lobby feels like a first class lounge. The uniformed hostesses asked if I would like water or something else, before heading over to the information center and 3D simulator. Once I reached the second story entrance to the information center, I noticed a red carpet leading to the check-in area. Checking in was a breeze. They look at your license, have you read a disclaimer about driving their racecars and sign it. I was then lead into the media room where they played a professionally made video about the Ferrari racecar that I would be driving, about the track and how to make the most of driving fast. Immediately following the video, I met a racing instructor that would be with me the rest of the day. Having individualized attention, with a professional driver, is key at this experience. The instructor assisted me into the racing simulator, which was preprogrammed with a laser-scanned import of the actual track I would be driving the Ferrari racecar around a later. There were about six of these 3D computer simulators in the room, but the instructor told me that there would be a total of twelve soon. 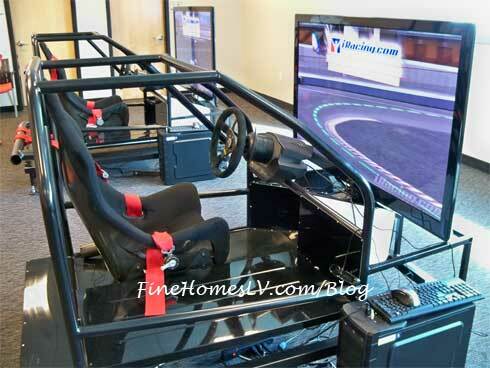 This assists with team building exercises and to see who drives the fastest, virtually anyway. After a few laps of the 3D virtual racing, I was ready to get into the real deal. They walked me out of the media center, across the Neon Garage South pit area where several of the Ferrari racecars were being worked on and we ended up back at the lobby for Dream Racing. I was then fitted for a racing suit, a head sock and a futuristic helmet that also has a microphone and speakers. At this point I was feeling like a racecar driver, I definitely looked like one. The instructor and hostess greeted me in the lobby and then the instructor and I went out to the actual racetrack, where the Ferrari’s were! Everything at Dream Racing is about luxury. Before I entered the track, another instructor opened the velvet ropes, like gaining VIP red carpet access to a big Las Vegas nightclub party. 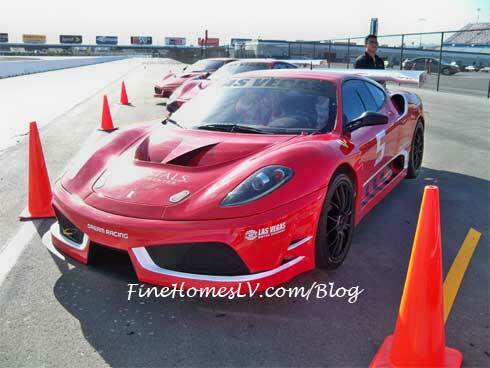 I headed over to the Ferrari F430 GT that I would be driving. As soon as I was situated properly, a support person attached my harness, seat belts and audio cable into my helmet. We checked our communications and finally started the engine! Hearing the engine of the racecar is when I really got excited. After a few short moments, the crew outside heard I was ready to go and released the pneumatic jacks on the racecar. The track is what I expected with a few twists and turns to keep things exciting, like the straightaway. This is where you can hit fifth gear at over 110 mph! The manumatic behind the steering wheel paddle shifting system on the Ferrari is like enjoying the best of manual, with the ease of automatic. Once back in the racing pit, my race crew had me out of my harness in a few moments and my instructor handed me a secure digital card. This card had the racing video from the laps I had just completed. Even though it may cost a little more, the immediacy of having this video is great. Otherwise, videos of racing experiences can take several weeks, up to a month to receive back in DVD format. If that amount of the experience wasn’t enough, I was offered to go another few laps or ride as a passenger in what is known as hot laps, to get the full experience. Hot laps are an option for people who want to get the Dream Racing experience without worrying about driving the track perfectly. 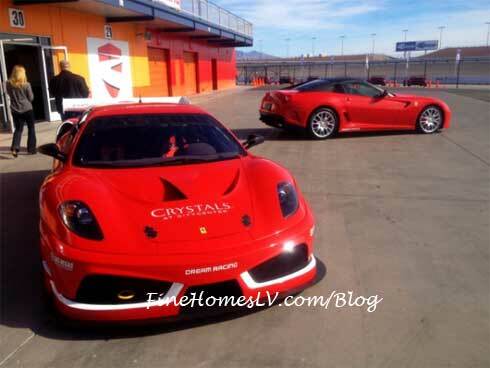 I chose the hot laps option because I wanted to see how a professional driver could handle the course and Ferrari. I went back into the lobby of Dream Racing to see who would be taking me on the hot laps. In walks Enrico Bertaggia, the CEO of Dream Racing and former Monaco Grand Prix race winner! Enrico is a very cool guy and he’s as excited to drive the Ferrari’s as his customers. As we walked towards the racetrack, he mentions that we’ll be driving his personal Ferrari 599, parked out front of course. We climbed in and the fun ensues around the track, faster than even one of the customers that we lap. I’ve experienced hot laps before, but riding with Enrico was a completely different situation, so much more fun. 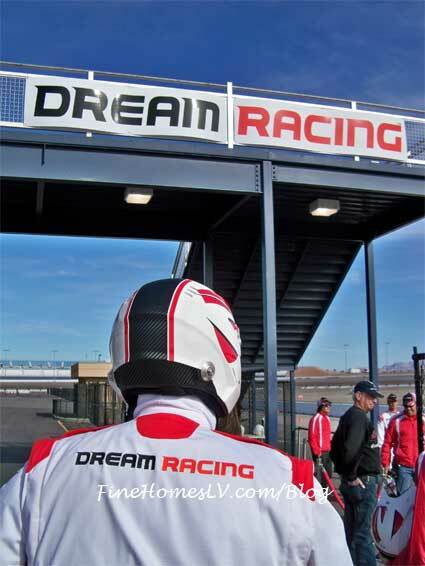 Dream Racing was unlike any other racing school that I have been to. The luxury, VIP red carpet layout and amazing European hospitality is something that I would recommend. I overheard a few ladies that had signed up for hot laps, say it was a once in a lifetime experience. 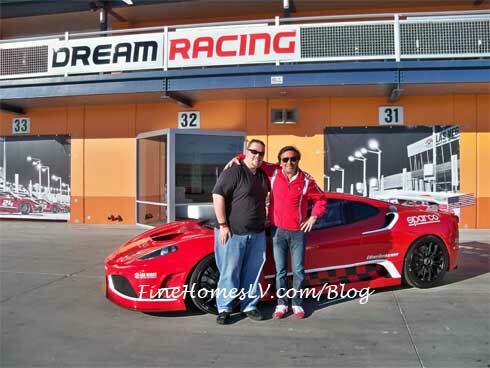 Thanks to the staff, my racing instructor and Enrico for making me feel welcome and my complimentary red carpet experience at Dream Racing at the Las Vegas Motor Speedway. Bellissimo!